Spray 5 mini tart tins with Pam. Roll out pie dough on a counter, cut out circles and place each circle over the sprayed tartlet tin and press dough down on the bottom and sides. In a large bowl, add granny smith slices, cinnamon, nutmeg, pinch of salt, brown sugar, and water. Toss to coat. Evenly spread cinnamon apple mixture amongst the 5 tartlet tins. In a small bowl, combine chopped pecans, cinnamon, sugar, brown sugar, and butter. Stir till all combined. 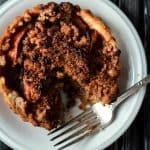 Sprinkle pecan streusel over each tartlet tin. Bake for 18-20 minutes, or until dough is slightly browned.